Abstract - Temporal complexity, bit error rate (BER) testing, and second order statistics like autocorrelation, level crossing rate (LCR) and average fade duration (AFD) play a significant role in fading channel modelling. These parameters describe the channel behaviour, the quality of the fading and the performance of the communication system. The present work focussed on the frequency non selective Rayleigh fading channel and on the filtered white Gaussian noise (FWGN) modelling method. Various Doppler spectra were evaluated through the above mentioned metrics using a Monte Carlo or a semi analytical method. The BER test was performed on two types of LTE (Long Term Evolution) single path channels: the ETU (Extended Typical Urban) channel and the EVA (Extended Vehicular A) channel. The transmitted signal was either M-PSK (M-ary Phase Shift Keying) or M-QAM (M-ary Quadrature Amplitude Modulation) modulated. Matlab was used as simulation tool. The objective being to discriminate and detect the best compromise among all considered Doppler spectra, for an appropriate design of the front-end digital communication system. Abstract - Nowadays, VANETs are one of the most important networks in the mobile network research domain; these networks have highly mobile nodes that are constantly exchanging information. High mobility, large number of vehicles, and lack of concentrated infrastructures has caused many problems regarding routing, communications security, Packet lost, repeated communications, inappropriate information transfer, etc. Moreover, due to the high mobility, the topology of these networks is constantly changing and optimal information propagation is one of the most important challenges in these networks. In this paper, the VANET`s nodes, i.e., vehicles, are grouped with an algorithm and information is exchanged in the form of small groups. This grouping reduces the constant topology changes. Moreover, it is predicted that grouping mitigates lost data and information transmission in different routes. This paper investigates the formation, selection, and identification of each group. Moreover, the grouping algorithm is optimized using particle swarm optimization to optimize the formation and head selection of each group. Abstract - Retrieval of similar images from large dataset of brain images across patients would help the experts in the decision diagnosis process of diseases. Generally used feature extraction methods are color texture and shape. In medical images texture and shape features are most efficient. A combination of low level features will get better result. The real MR images contain brain and non-brain voxels (especially the skull). The presence of the skull degrades the performance of the system. So in this paper we perform a preprocessing step, called skull stripping. Then the methods are applied to the preprocessed image. Here we propose a combined method of HOG (Histogram of Oriented Gradients) and LBP (Local Binary Pattern). HOG is a shape feature extraction method and it results HOG histogram. LBP is a texture feature extraction method and its output is LBP histogram. Then combine these methods by adjusting appropriate weights. The results shows that the combined feature outperforms the individual feature and preprocessed image is outperform the original image for image retrieval. Osahenvemwen, O.A. and Ikheba, O.S. Abstract - The unprecedented growth in the number of subscribers has led to over stress of limited mobile communication capacity resulted to low quality of service. 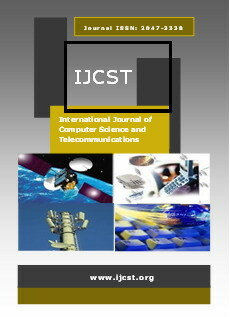 This study presents the evaluation of QoS in mobile communication network; aim to determine the parameters that affect quality of service and possible solution. Mobile communication network under investigation is called Network D located in Esan west LGA, Ekpoma, was considered in this research work. Data were obtained from Operational and Maintenances Centre (OMC) such parameters were calls drop, block calls, network congestion, sound quality and low signal from network D for period of one year. It is observed that has the number of attempt calls increases also the number of blocks calls increases in a proportional rate. Also, the clear technically differences between block calls and drop calls were highlighted in the mobile communication network and the causes of drop calls with relative percentage were outline. In addition, the signal strength transmitted from the BTS under investigation does not exhibit a linear characteristic. It is observed that block calls increases during the busy hour based on high number of subscribers using the limited capacity of the mobile communication network.